June's team training weekend was based out of the Spittal of Glenmuick Mountain Rescue post. The goal of the exercise was to improve our knowledge of the crags around the Dubh Loch area, improve our primary survey and line searching skills, as well as test out some potential new recruits to give them an idea of what being an operational member of Aberdeen MRT is like. The exercise started from Glas Alt Shiel with a stretcher carry up to the Dubh Loch where we were shown and briefed on the crags and climbing routes in the area. This is essential information as it ensures that if a callout in this area occurs, little time is wasted working out where to go. Following on from this, the team and in particular, the recruits were put through their paces as we headed up with the stretcher through, tough steep ground, with the mercury already rising and there being little wind. A beautiful, but scorcher of a day! Above the steeper ground, we broke into groups and practised our primary survey. This survey is crucial for all team members to know as it ensures we can identify immediately life threatening conditions and manage them. As it most likely won't be the team doctor that finds the casualty on a callout, we all need to have these skills well practised. 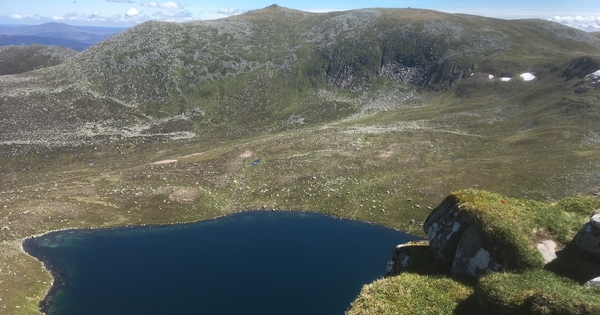 Following a further strecher carry, the team topped out at the summit of the Stuic buttress and after a bite to eat, began the next phase of the exercise. A callout scenario was presented and we commenced a full team line search for two 'missing casualties' in the Lochnagar area. We searched along the Stuic plateau, resetting our bearing, then moved down in to Loch Buidhe. Here we re-grouped before searching once more but this time towards the Glas Alt Bridge. Following a succesful line search, two casualties were located, their 'injuries' treated and they were evacuated off the hill. A tough day in beautiful conditions that served as a great reminder that good personal admin is just as important in summer as in winter, just with a bit more sun cream!